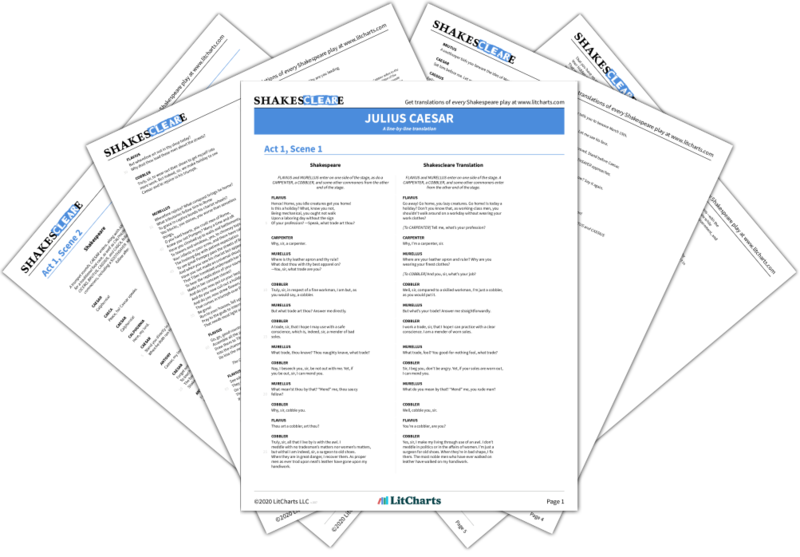 Instant downloads of all 942 LitChart PDFs (including Julius Caesar). In Julius Caesar, the human body echoes the body politic: the conspirators call Caesar's autocracy a sickness that must be cured; the sleepless Brutus speaks of a rebellion in his body mirroring the rebellion he plans; and Calpurnia's dream about Caesar's bleeding statue is reinterpreted to mean that Rome draws its life from Caesar, as if his health were synonymous with the city's. Physical strength and weakness is important too. Portia courts pain as a means of proving her worth, and Caesar's great power is contrasted by infirmity—he's epileptic and partially deaf. Florman, Ben. "Julius Caesar Symbols: Body, Blood, & Pain." LitCharts. LitCharts LLC, 22 Jul 2013. Web. 16 Nov 2018. Florman, Ben. "Julius Caesar Symbols: Body, Blood, &amp; Pain." LitCharts. LitCharts LLC, 22 Jul 2013. Web. 16 Nov 2018. Florman, Ben. "Julius Caesar Symbols: Body, Blood, & Pain." LitCharts LLC, July 22, 2013. Retrieved November 16, 2018. https://www.litcharts.com/lit/julius-caesar/symbols/body-blood-pain. Florman, Ben. "Julius Caesar Symbols: Body, Blood, &amp; Pain." LitCharts LLC, July 22, 2013. 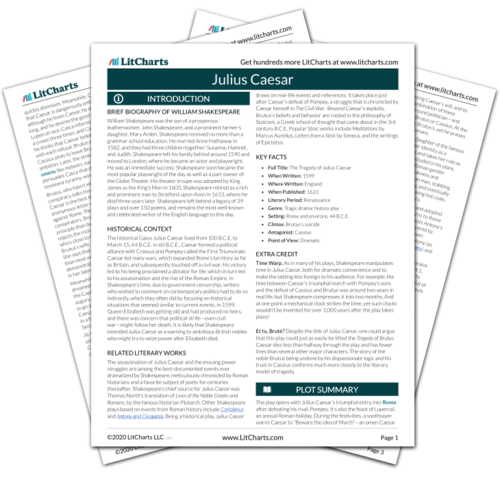 Retrieved November 16, 2018. https://www.litcharts.com/lit/julius-caesar/symbols/body-blood-pain.